This 64GB memory TV BOX will meet your biggest storage requirement! 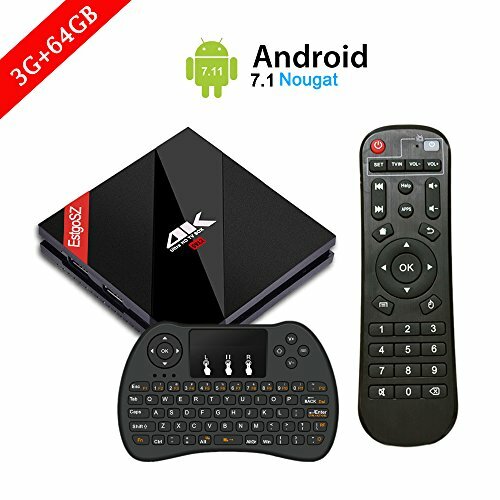 ESTGOUS Android tv box: Chat, entertainment, movies, games, social networking etc at your fingertips! Higher configuration for you! H96 pro plus 3g 64g android 7.1 OS TV box allows you to get more, it must be a great gift, entertainment machine, to provide you with more intelligent wireless/convenient life. Video Codecs : VP9-10 Profile-2 up to 4Kx2K@60fps / H.265 HEVC MP-10@L5.1 up to 4Kx2K@60fps ect. 【 3GB RAM + 64GB ROM 】 The latest Android TV BOX wtih 3G DDR3, higher running speed, no buffer or abort. The biggest storage, up to 64G EMMC memory, provide enough space to run unlimited games and movies, users can enjoy faster read & write speed, make the TV BOX run more stable and smoothly. 【 More Convenience 】Simple connection and easy use: the HDMI port, the Power supply, the Wifi / Ethernet Cable. This H96 Pro+ box also support the mouse / wireless keyboard control. ( Tips: the keyboard is included ). Enjoy the sofa , Enjoy the smart ! 【 Android 7.1 OS 】The Newest version android system. Compatible More! More Stable! Meanwhile, dual-band wifi 2.4G/5G & BT 4.1 & Ethernet 1000M LAN supported will be a excellent assistant! 【 More Owerful and Faster】Powered by Octa core Amlogic S912 Cortex A53 processor runs at 2.0 GHz, it's fast enough to get video flawlessly. With a Mali-T820MP3 GPU focusing on maximizing the efficiency of processing. 【 What you've get 】We provide FBA fast shipping and 1 year warranty + free lifetime technology support. If any problem with this box, PLEASE DO CONTACT US, you can return it for full refund or a new one. What any other else you are worrying about? Just buy, don't worry!